I remember where I was in 2000. I was pumping gas at main street sunoco in Leominster, MA. 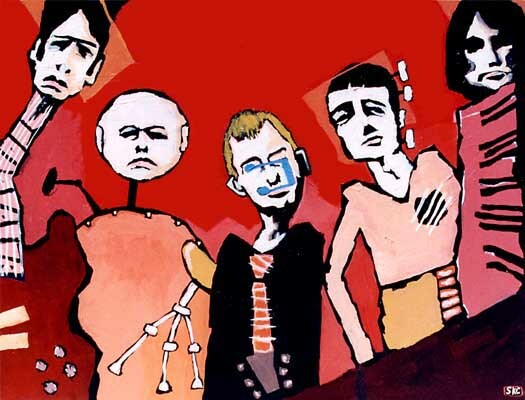 Mike G. had recently turned me on to the greatness that is Radiohead. He would burn me copies of CDs and talk passionately of how great a band they really were. Discussing song lyrics, certain musical changes, and just why they were such an important band for our time! He was a somewhat practicing vegetarian and most nights ordered spaghetti with sauce, “make sure its not the meat sauce!” he’d bark into the phone. He also had this kind of lingering, foul odor to him, but that’s not why I’m writing this dispatch. It’s just that so much has happened in the last 12 years, from the age of 17 to 29, as this is such a pivotal period for anyone. 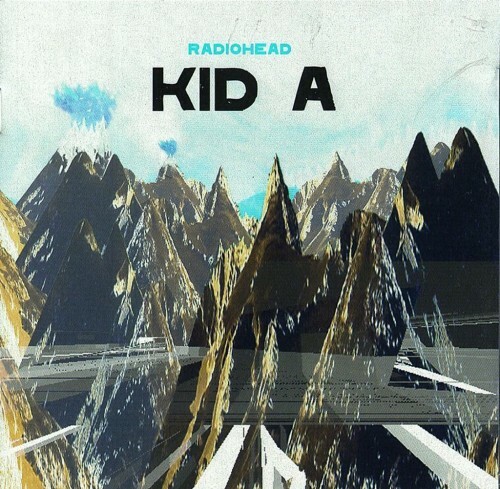 Kid A was something so huge, so dense, so intense, that I was really only trying to grasp alternating programmed beats and general absurdity of the lyrics. 2001 was my first time seeing them live at Suffolk Downs and I really have to give Mike G. the credit for opening my mind up to them 2 years prior. A part-time job pumping gas, for the most part screwing around when our bosses left at 5. So from 5-10 we played CDs in the little store, while switching off who would get the next customer. Sunoco in Leominster being really only 1 of 2 Full serve stations, so later on at night you’d get stragglers, nothing too steady. So 12 years removed from the release of “Kid A” and having seen them at least 4 times live, I understand the power of speaking passionately about a band you love to someone else. Especially to an already impressionable 17 year old. The Grammy’s. A female affair, but that’s just fine. Lady Gaga, Taylor Swift, Miley Cyrus, Pink, and now Beyonce. Feels more like a preview of the upcoming Lilith Fair. Tis’ not the year of the band. But you figure, with major records getting less press, FM radio dwindling, big surprises are short in supply. Green Day performed with the cast of their upcoming Broadway show, I believed based on the album “American Idiot.” Lady Gaga’s performance was somewhat understated, but theatrical enough for the Grammy’s. The bit with Elton John was nicely put together…both smearing ash on their faces, with matching glasses…never short on memorable imagery. Whoa, Beyonce covering Alanis Morissette “you ought to know.” Nice touch – Random cover, but it works with her range. I sure do miss Radiohead not being there…last year’s performance of “15 step” was amazing. Well they are putting out a studio disc sometime this year, so let’s cross our fingers. I anticipate the content and I have a feeling the delivery method will probably be unique yet again. I’m thinking they might just drop thousands of CDs from planes and it will be like a scavenger hunt for all fans. Might promote a sense of terrestrial community, over just sucking it up electronically? Radiohead has continued music’s oddest feud with Miley Cyrus after blasting her for threatening to “ruin” the band. Cyrus revealed she had made it her mission to “ruin” Radiohead after frontman Thom Yorke snubbed her at the Grammy Awards last month. The Hannah Montana star requested a meeting with her favourite band when she discovered their dressing room was four away from hers, but Yorke politely declined because he was preparing himself for his first performance at the music Oscars. In a radio interview last week, Cyrus said, “My manager asked and said, you know, ‘Miley, she’s really obsessed and she’d really like to meet them,’ and they were like, ‘Yeah, we don’t really do that. '” Cyrus was left humiliated by the slight – because she had already boasted to her friends about meeting the band. She adds, “I left ’cause I was so upset. I wasn’t going to watch! I’d already texted all my friends, we were all freaking out.” And the teen sensation was so hurt she made an instant decision to expose Radiohead as mean guys – something that has annoyed Yorke. Now I don’t want to come off as a pretentious fan of Radiohead, who would feel that he has the right to claim who is worthy to listen to any given band. But this little side story to the Grammy’s is kind of hilarious on the surface. I mean can you really picture this teeny bopper sitting on her tour bus, listening to “knives out” or “I will” before a big sold-out concert in Disney World? But hey I could just be the loser making rash assumptions about the depth of this pop idol. The entitlement bit was funny on Radiohead’s part, but I suppose this behavior is to be expected by a 16 year old. Although all kidding aside, a Rolling Stone cover featuring Thom and Miley would be some collector’s item. How come the grammys end up where they started? 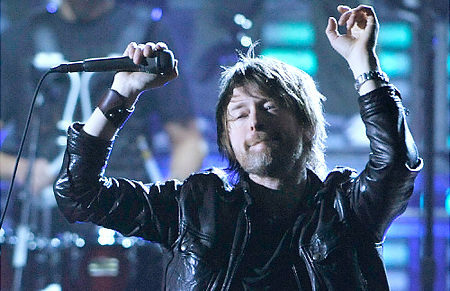 I thought Thom Yorke and Johnny Greenwood’s appearance at the Grammy’s, gave the whole night its really only raw musical presentation. Just Johnny and his vox, while Thom was free to roam and do his thing. (He looked closer to the Thom of the “Pablo Honey” era with all of the hair; minus it being blonde) The USC marching band must have caught everyone off guard, as it added a lighter air to the often “dark, moody” vibe the band receives in general. The Grammy’s are really about honoring the established pop acts that support their crumbling industry. John Mayer, Justin Timberlake, Kenny Chesney, Stevie Wonder, Neil Diamond, what use to be of Whitney Houston, and I guess Jamie Foxx? Don’t get me wrong, Radiohead is very mainstream in the main scheme of things. Even the fact that they decided to play was kind of interesting considering how anti-big music/awards/interviews they’ve been for so long. Maybe that’s what I love about the band. They constantly skirt the line between approaching music independently, appearing on movie soundtracks, appearing at awards shows, and recently dropping their ties with a major label in Capitol. I am biased in who should win album of the year, being an avid Radiohead fan for the last 8 years or so. But consider the precedent the band set in late ’07 in giving it away/demanding fans to set the cost they deemed worthy. Radiohead is clearly at a stage where money takes the backseat to questioning the whole record institution outright. It speaks to how music is becoming more of a blog accessory, movie trailer add on, and background ad. device in general. I think the opportunities for bands to showcase their music is ever expanding, it’s just finding the hot niche market or creating a marketable promotion tool like Radiohead has. The record industry was always about putting out the next best single from an established artist on the radio then waiting for huge “record” sales to come in. But the “record” is quickly being replaced by the flavorful “single of the week”. So in order for “In Rainbows” to be viable as a record, Radiohead must have seen this as a no brainer. Not to mention the striped down/universal appeal (research the song “knives out” and you’ll understand their own production standards) the album sustains from start to finish. Just today I read an article about how Joe Satriani is suing over Coldplay’s song “viva la vida” for plagarism. This doesn’t surprise me, especially considering how on their last album they admitted to ripping off a Kraftwerk melody note for note. The British Boys and Mens clubs.